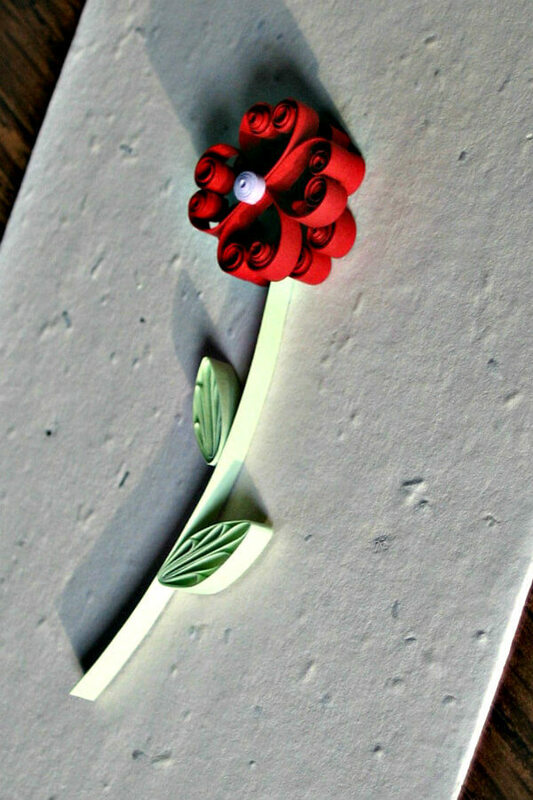 If you've been thinking of giving quilling a try, this quilled Valentine card tutorial would be a good place to start. The message inside says May our love bloom and grow which would work for an anniversary as well as Valentine's Day, or you could change the our to your and send it as an engagement or wedding card. Very few supplies are needed to quill; you probably have most on hand or can make substitutions to get started right away. 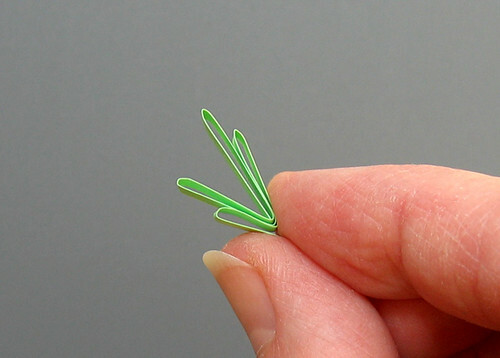 Quilling strips are slightly heavier than copy (computer) paper and are sold in single or multi-color packages containing 40-100 strips. Copy paper works fine for practice though... just cut a sheet into narrow strips with a paper trimmer. 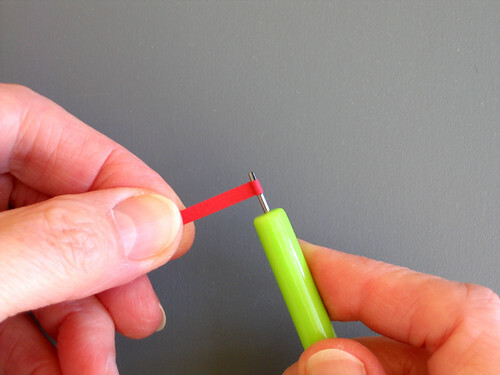 There are two basic types of quilling tools - needle or slotted; the choice is a personal preference. A slotted tool is very easy to use, but leaves a tiny crimp in the center of a coil. 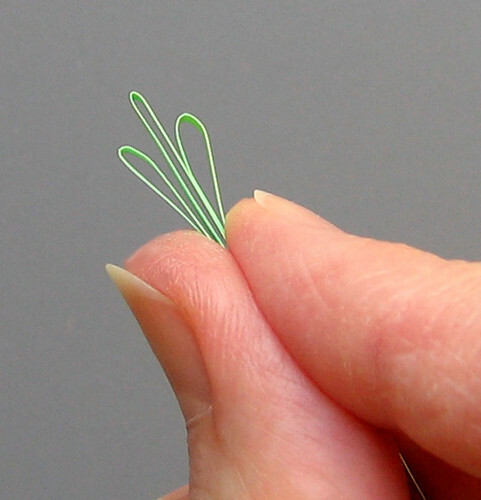 While a needle tool is a little more difficult to master, the coils it creates will have perfectly round centers. Before purchasing one or the other, try a stiff wire, corsage pin, or even a cake tester from your kitchen drawer to get the feel of rolling paper. To roll a coil with a slotted tool: Slide one end of a strip into slot – the paper shouldn’t extend beyond it. Rotate the tool with one hand while evenly guiding the strip with the other hand. To roll a coil with a needle tool: Hold the tool handle with one hand and dampen the thumb and index finger of the other. Place one end of the strip across the needle. 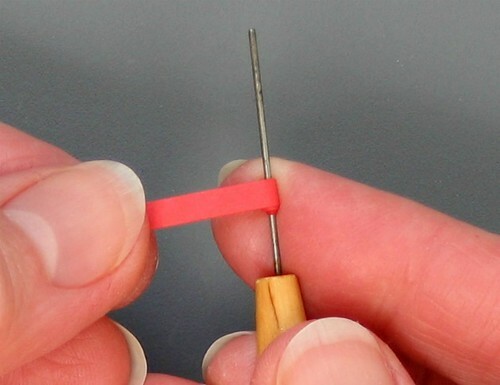 Roll the paper around the needle between your thumb and finger, taking care to rotate the paper, not the tool. When the strip is fully rolled on either tool, release the coil and slip it off the tool (the result is a loose coil) or glue the end in place and slip this tight coil off the tool. Tip: A torn end will blend better when glued than a cut end on a tight coil. The result will be a coil with a smooth edge and perfectly round appearance. When gluing quilling, use the smallest amount of glue possible and keep a damp cloth handy to wipe any stickiness from your fingers. I like to apply glue by dipping the tip of a glass head pin into a small dab I've placed on a non-stick surface (a plastic lid works well). The use of a glue bottle with a very fine tip is another method that many quillers like. To create the flower shown here, you'll need to make eight heart scrolls as the flower petals, one tight coil as the center, a stem, and two leaves. See? Not that much; you can do this! 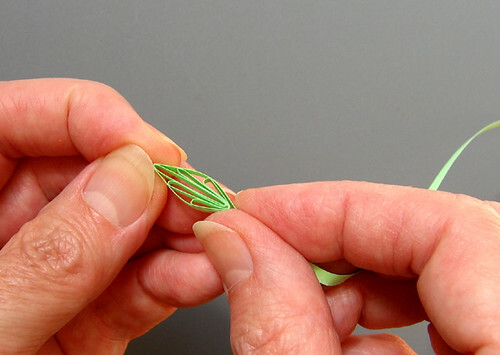 Make the tight coil flower center: Cut a 3 inch lavender strip in half along its length. Discard one strip and tear one end of the other. Roll this strip starting with the cut end and glue torn end in place without allowing the coil to relax. Slip coil off tool. Press the ball of a glass head pin against one side of the tight coil to give it a domed top. Use the pin to apply a bit of glue inside the dome to preserve the curve. 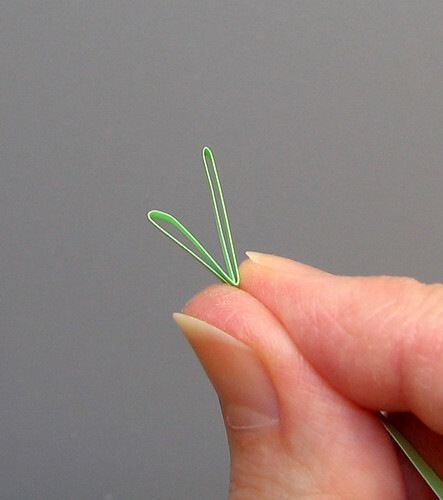 Make the stem: Glue two 2.5 inch green strips back-to-back. 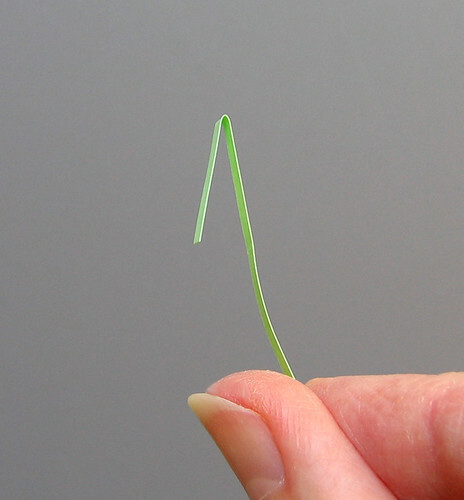 When the glue has dried, curve the stem a bit by bending it around the quilling tool handle. Make the large leaf: This is an alternate side looping technique called husking. a. 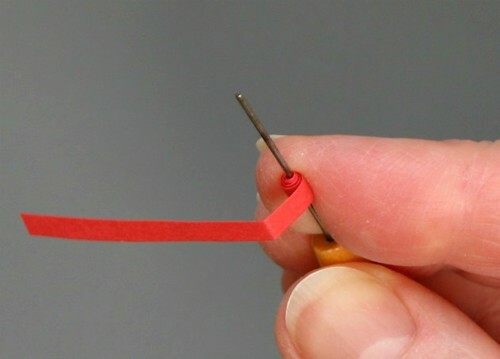 Begin by making a 1/2 inch fold at one end of a quilling strip. b. Next, make a loop to the left of the fold that isn’t quite as tall as the fold. c. Make a second loop, this one to the right of the fold. d. Make another pair of loops, not quite as tall as the first pair. e. Encircle all of the loops with the same continuous strip to create a collar. Glue end in place at the bottom of the leaf and trim excess paper. 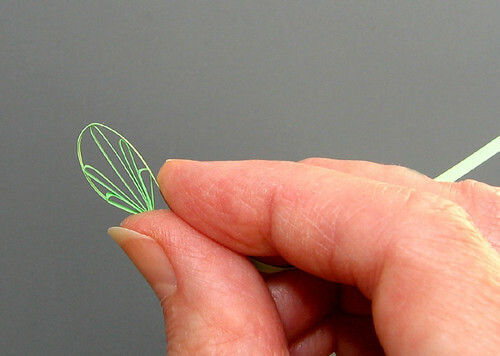 Make the small leaf: Repeat the large leaf steps, making the first fold 3/8 inch. a. Make one layer of the flower by gluing together four of the heart scrolls with points facing inward. Make a second layer with the additional four heart scrolls. Again, be sure to apply just a tiny amount of glue with the tip of a pin; no glue should show once the scrolls are in place. Allow glue to dry for a few minutes. b. Spread a shallow puddle of glue on the non-stick surface and pick up one scroll layer with tweezers. Touch the underside of the layer to the glue and place this layer on top of the other layer, offsetting the heart scrolls so they don't directly overlap. c. Glue the flower center to the top layer. d. Glue one end of the stem between two of the hearts scrolls. e. Glue one leaf on each side of the stem with the large leaf in the lower position. When the glue has dried, glue the flower on a card or journal cover: Holding the flower gently with tweezers, touch the underside to the shallow glue puddle and then place it directly where desired. Try not to slide the flower into position as that would leave a shiny snail trail of glue. Make the card: Cut an 8.5 x 11 inch sheet of card stock in half across the width. Use a bone folder, dull knife, or a trimmer scoring blade to crease one of these halves in half again. Fold card along scored line. The result is a 4.25 x 5.5 inch card. Layer additional paper rectangles in graduated sizes, if desired. Use a glue stick or double-sided tape to adhere layers. I hope this will be the first of many quilled cards you'll make! 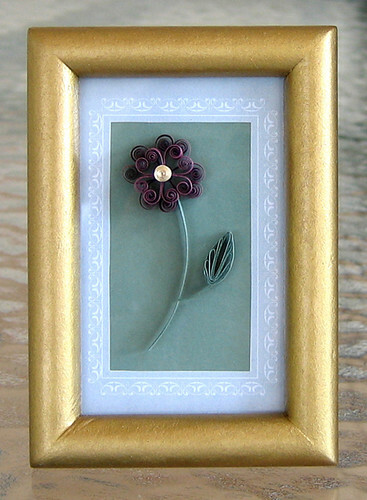 Of course if cards aren't your thing, another idea would be to place the flower in a small frame. You'll find more quilling ideas, including another Valentine, in my books Creative Paper Quilling: Wall Art, Jewelry, Cards & More and All Things Paper: 20 Unique Projects from Leading Paper Crafters, Artists, and Designers. One last thing... I'm putting together a new page tab that will be called Quilling FAQ. 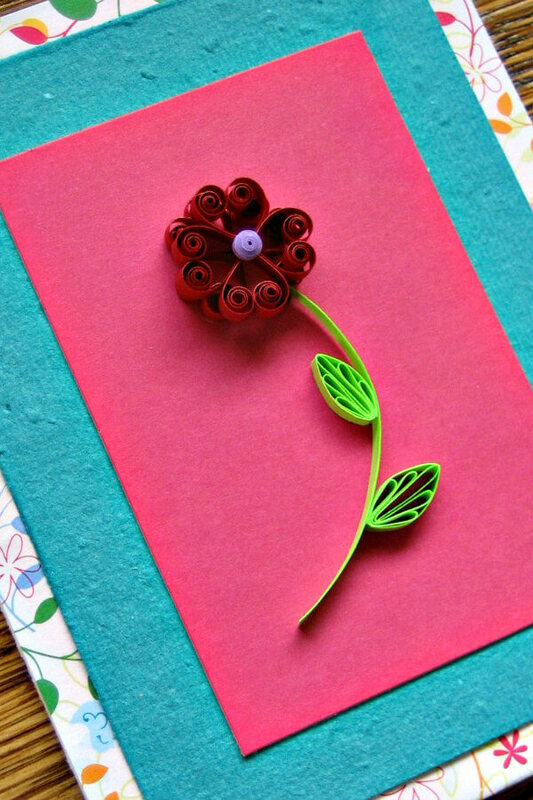 On Facebook recently I posed the question, What do you want to know about quilling? but because not everyone is on Facebook, I'm asking the same question here. Just leave your questions/comments below or email me at ann.b.martin@gmail.com and I'll try to include them in the list. Fantastic tutorial, Ann! Love your flower design. Have a great week! So pretty! 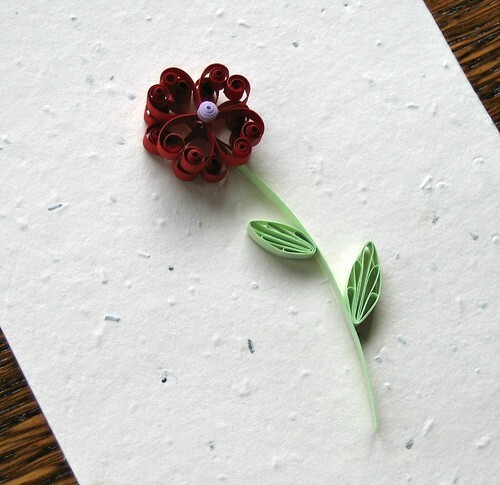 I am very new to quilling and think I will give this project a go. You make it seem so easy with your step-by-step instructions. i adore your alternate side loopings! !great tut! love the topic..."what do you want to know about quilling?" 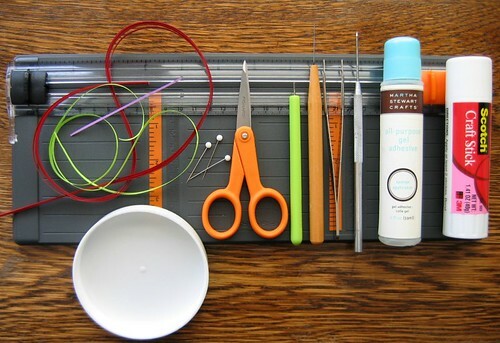 So perfect , you have so many gluing tips in this post which is so helpful for beginners . Thanks so much for the tutorial...this looks like something I can do!!!! ann...sorry i was the anonymous blogger....but i am curious about your gel adhesive glue?i haven't heard of this type of glue? Thanks everyone! Licia, the clear gel-type glue I use is Martha Stewart Crafts All-Purpose Gel Adhesive. I've noticed other companies make something very similar. The reason I like gel adhesive more than white craft glue (PVA) is because it doesn't develop a 'skin' when I put a small puddle of it on a plastic lid. Instead the puddle stays completely workable for hours. I also like that it doesn't have any smell and rinses off my fingers easily. wow....sounds so much better! i will definitely keep an eye out for it here in oz. thanks ann for the hint. Thanks Natalie! If you're in the U.S., I recommend Custom Quilling, Whimsiquills, Quilling Supply Plus... actually all of the online suppliers that I'm aware of are fine and stock lots of beautiful paper colors and types. If you're not in the U.S., then google quilling supplies and the name of your country to see what's available. 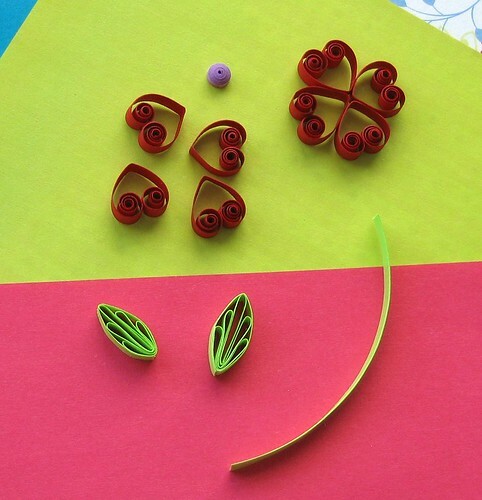 Happy quilling! super.. simple easy & Lovely! Beautiful, simply beautiful! You make it look so easy!